This function increases the heating or cooling to the maximum effect. So the air cools or heats up quickly and the desired temperature is achieved in a short time. This function allows the unit to increase (cooling) or reduce (heating) temperature in 1°C per hour during the first two hours. During the first 5 hours the unit keeps the same temperature, afterwards it turns off. The function ensures an ideal temperature and saves energy. If there is a power failure and the unit turns off, once power supply is restored, the unit restarts automatically with the last selected settings. If an error occurs in the temperature sensor, the air conditioner will display an error code and it will turn off immediately. 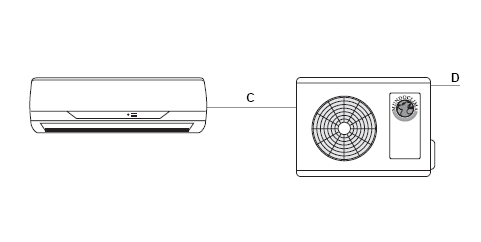 When cooling mode is on, the fan speed increases automatically from the predetermined lowest level, according to the heating of the evaporator. So the initial cold flow exit is avoided which is not pleasant for the user. Up to 25 levels of frequency of the compressor (F1-F25), and a major range of frequency of 70 %, plus a more exact and accurate control which guarantee comfort and energetic saving. Thanks to modern technology that adjusts the frequency to the compressor preheat, the unit can operate in temperatures as low as -20 ° C.
Eliminates formaldehyde and other organic volatile compounds (COV) as well as harmful gases and odors. This function increases the heating or cooling to the maximum effect. In this way the atmosphere cools or heats up quickly and the desired temperature is achieved in a short period of time. With this new technology, an alarm sounds from the indoor unit if a coolant leak on the outdoor unit is detected. Up to 12 levels of fan speed of the indoor unit ensure a pleasant air flow for comfort and wellbeing. The air conditioner can operate in low temperatures and can be used to cool even when the outdoor temperature reaches -15ºC. 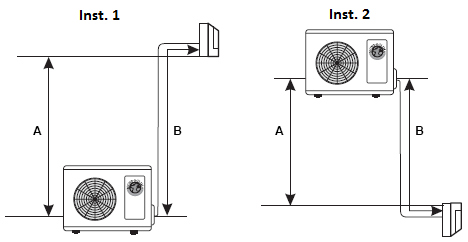 The indoor unit compensate the temperature variation due to the hight of the installation. Thanks to the DC fan motor the amount of speeds increases from 2 to 5. These levels of speed ensure a better comfort and energy saving. ON/OFF intelligent technology allows energy saving in Standby mode. In this way the energy consumption can be reduced from 4-5 W to 1 W, resulting in an energy saving of 80%. Connection pipes Liquid inches 1/4" 1/4" 1/4" 3/8"
Gas inches 3/8" 3/8" 1/2" 5/8"